Former Reagan White House attorney, David B. Nolan Sr., is a “dangerous truther” who was granted a Q2 nuclear safety clearance. LBJ's and Nixon's Patsy compiles information now in the public domain that was covered up for over 50 years. 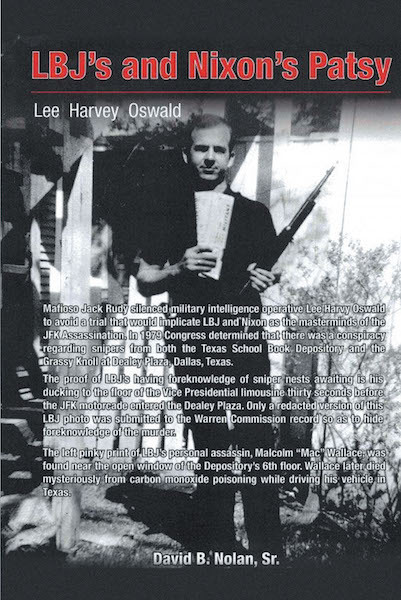 Oswald was deliberately denied a trial to prove his innocence and to show that Lyndon Baines Johnson and Richard Nixon masterminded the JFK murder. Nolan is the 2014 co-author of Quest for Freedom published on Amazon Books. He is the author of the Ethics Section of the District of Columbia Practice Manual. Who's Who in American Law recognized Nolan in 1980 and Who's Who in America in 2002. Nolan's amicus briefs in DHS v. MacLean helped the first federal employee respondent ever to defeat the U.S. Justice Department at the U.S. Supreme Court in DHS v. MacLean, case 13-843. Whistleblower MacLean was fired when he disclosed to Senator Hillary Clinton the reduction of air marshal deployments immediately after 9-11. In January 2015, Nolan helped give president Obama one of his worst legal defeats in the support of the rule of law for MacLean by a 7 to 2 U.S. Supreme Court vote.